-How many foreign nationals are working with the INGO and what are the responsibilities given them for implementing the programs? -How were the criteria, methods and procedures for selecting local partner organizations as stated in the agreement determined? -In whose names are the bank accounts for partner organizations to spend money being operated ? Which are the banks where the accounts are being operated? KATHMANDU, Dec 10: The National Reconstruction Authority (NRA) has sought clarifications from the World Vision International following complaints registered against the organization with regard to the reconstruction-related work it is carrying out in earthquake-hit districts. NRA has said that the organization has been accused in the complaints of breaching the conditions of the agreement signed with NRA. NRA in its letter written to the INGO on Monday sought clarifications within seven days over three specific points. “How many foreign nationals are working [with the INGO] and what are the responsibilities given them to implement the programs?” NRA has questioned. It has also asked from where the foreign nationals received recommendations for their visas. 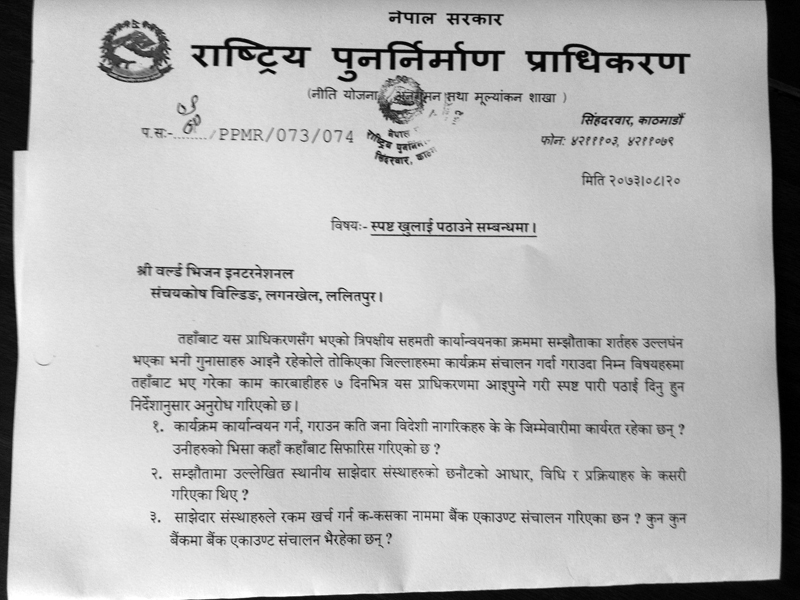 “How were the selection criteria, methods and procedures for selecting local partner organizations as stated in the agreement determined?” reads the letter, a copy of which was obtained by Republica. In its third question, NRA has asked, “In whose names are the bank accounts operated for the partner organizations to spend the money?" Copies of the letter were sent to the Office of the Prime Minister and Council of Ministers and to the Social Welfare Council. NRA has asked the council to provide some related particulars about the organization. The organization was permitted to spend Rs 3.27 billion for various programs. It is allowed to work to build private houses, health posts and water, sanitation and hygiene related facilities in Dolakha, Sindhupalchwok, Nuwakot, Dhading and Gorkha districts. Locals in Gorkha and Dolakha districts were outraged as they were allegedly not provided assistance as committed by the organization. In Gorkha, the locals also accused the organization of spending aid money “on logistical purposes in a luxurious way while the earthquake victims weren't provided the support meant for them”. Similarly in Dolakha district, the organization was accused of misusing the funds meant for earthquake victims. Meanwhile, Pushkar Khati, public engagement associate director of World Vision International, said that the organization has received NRA's letter and was preparing a reply. “We will send our answer to NRA within a few days. 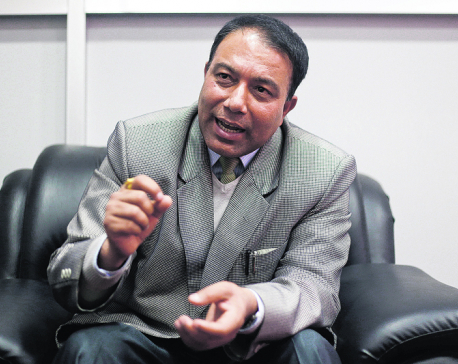 We are ready to conduct necessary investigations through our own internal mechanisms and we will also allow NRA to investigate the issues if needed,” Khati told Republica.